Easily one of my favourite cafes in Melbourne, Dukes Coffee Roasters is a must visit for all coffee lovers in the city. It’s not a sit down all morning and have brunch kind of cafe, in fact, it’s predominately a grab and go kind of place. However, if you can bag yourself a seat then it’s the best place to sit back and watch the hustle and bustle of mornings in Melbourne with a Flat White coffee. In terms of decor, Duke’s really is your typical Melbourne cafe, meaning it’s small, a little atmospherically dark and quite minimalistic with an eclectic yet modern feel. 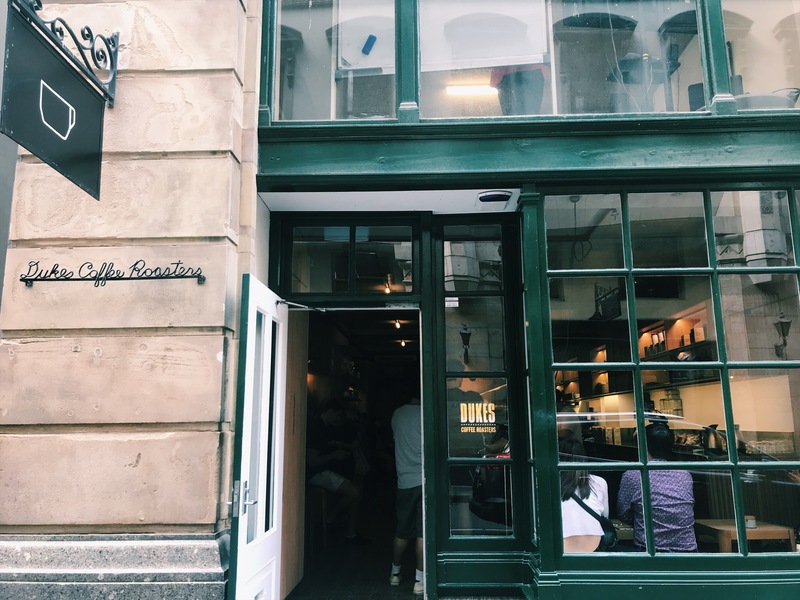 The cafe is located right in the heart of the city’s coffee district on Flinders Lane and Dukes is one of those cafes that I had meaning to try for a while but I’d never been able to get a table. My advice- go early on a Saturday. On Saturday mornings Dukes opens at 9am and you really need to get there then if you don’t want a takeaway. Dukes offers a range of coffees, teas and hot chocolates. They also have, what I think is the best selection of cakes, pastries and biscuits around. I had to cave in and get a peanut butter and chocolate cookie which was superb: healthy eating starts next week. Looking for more cafes in Melbourne? Check out my other picks here.